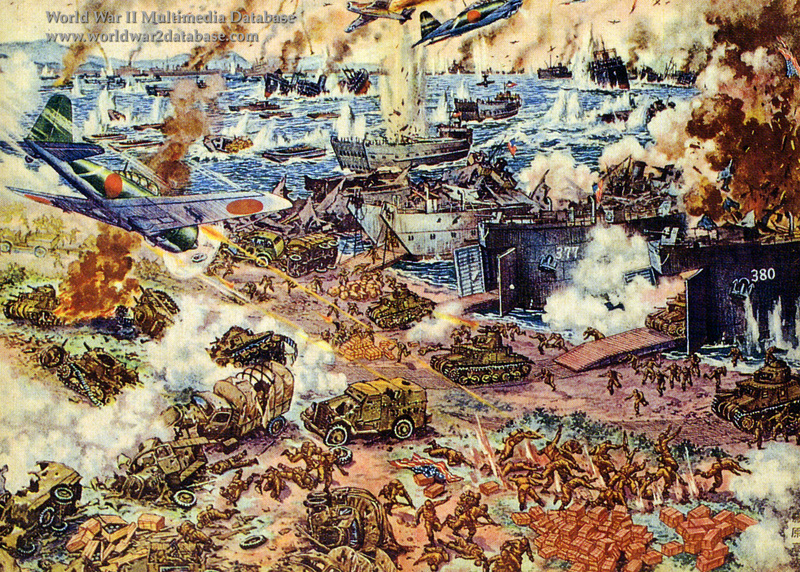 Artist's rendition of the Japanese counterattack on Leyte that appeared in a Nisshin Corporation magazine. Note M3 Grant tanks and a wide range of landing craft. The size of the American force is incongruous with the battle damage the fleet has received; astute Japanese could read between the lines of the state-controlled press and realized that Japan was losing the war. Actually, the Americans dominated the air and sustained combat operations prevented the Leyte garrison from mounting any major counterattack. The Japanese public was denied accurate information about Pacific War operations. Unlike the Americans, who used after-action reports as intelligence as much as they used them for propaganda, the Japanese military subtly encouraged inflated tallies of battle damage, claiming that many aircraft carriers, ships and aircraft were sunk, while ignoring the huge losses to their own forces. The inflated reports were published as fact, and the real losses were classified. Eventually many officers believed their own propaganda, thinking the Americans had suffered unrecoverable losses. The debacle of losing the last effective surface fleets in the battle of Leyte Gulf was not revealed until after the war.